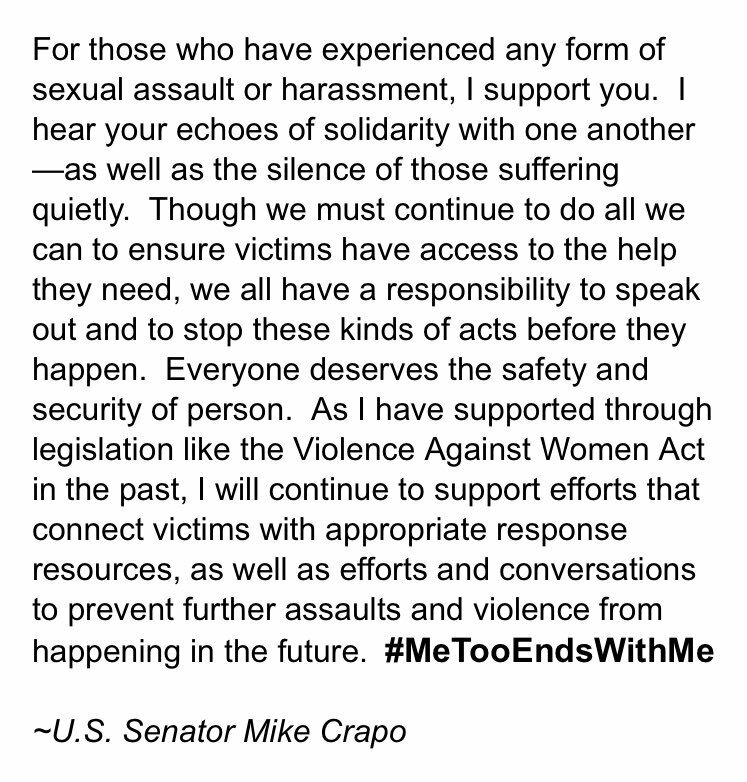 Tue., Oct. 17, 2017, 9:56 a.m.
Crapo was the lead GOP sponsor of the Violence Against Women Act reauthorization in 2013, which extended the law for five years after it expired in 2011. The measure, first enacted more than two decades ago, funds millions in federal programs that assist victims and survivors of domestic violence, dating violence, sexual assault and stalking. Idaho’s congressional delegation was divided on the bill, with Crapo and 2nd District Rep. Mike Simpson supporting it, and Sen. Jim Risch and 1st District Rep. Raul Labrador voting against it. Crapo has been a longtime advocate for measures to fight domestic and sexual violence.